Every summer, millions of sooty shearwaters Puffinus griseus arrive off the coast of California, their huge flocks astonishing visitors who may have trouble grasping that the dark swirling clouds over the water consist of seabirds. Scientists have long known that sooty shearwaters breed in New Zealand and Chile and migrate to feeding grounds in the Northern Hemisphere. The details of this remarkable transequatorial migration have emerged from a study by a team of Californian, New Zealand and French scientists using electronic tracking tags to follow the paths of individual sooty shearwaters. Nineteen birds were tracked for about 222 to 313 days to reveal flights across the entire Pacific Ocean in a giant figure-of-eight pattern, flying around 65,000 km (39,000 miles) in a roundtrip journey. It is the longest animal migration ever recorded with electronic tracking. The flights of these small seabirds weighing 800 grammes were obtained with miniature archival tags weighing 10 grammes that log data for position, dive depth and ambient temperature. Each shearwater made a prolonged stopover in one of three discrete regions off Japan, Alaska or California, before returning to New Zealand through a relatively narrow corridor in the central Pacific Ocean. The birds were recorded travelling from 724 to 1096 km/day, and were found to obtain food in the most productive waters from the surface of the ocean to a depth of 68 metres. These small seabirds cross the equator twice a year in pursuit of an endless summer in which their feeding areas are always at or near peak productivity. The only other bird that could rival the migrations of the sooty shearwater would be the arctic tern, which breeds in the Arctic and migrates to Antarctica. "But we don't know if they do that in a single season, because nobody's ever tracked them", said Scott Shaffer, a research biologist at the University of California Santa Cruz, and first author of a paper published in the mid-August 2006 edition of Proceedings of the National Academy of Sciences. 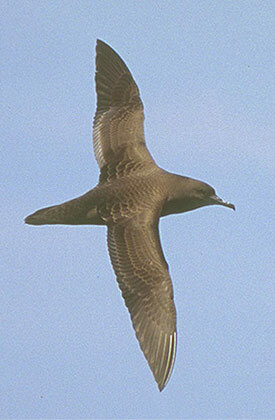 The researchers found that the migratory cycle of sooty shearwaters encompasses the entire Pacific Basin, focusing on the richest feeding grounds in both hemispheres - from Antarctic waters in the south during the breeding season to bountiful coastal currents off California, Alaska, and Japan in the north. 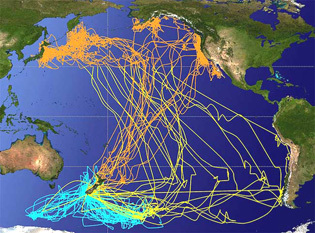 Tracks of 19 sooty shearwater migrations originating from breeding colonies in New Zealand. 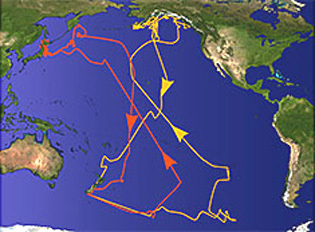 Flight patterns of birds are shown during breeding (light blue); the start of migration and paths of northward transit (yellow); and wintering grounds off Japan, Alaska and California, and southward transit back to New Zealand (orange). Diving patterns recorded by the tags indicate the birds stop little if at all to feed as they pass through the equatorial regions on their journey between the Southern and Northern Hemispheres. "When they cross the equator, they're traveling fast and not stopping much to feed. They feed near Antarctica during the austral summer, then zip north to feed in one of three areas of the North Pacific, taking advantage of high productivity throughout the year," Shaffer said. The shearwaters feed on fish, squid, and shrimplike krill, which they take from the surface or pursue underwater. The electronic tags recorded birds diving to depths as great as 68 meters (225 feet) to capture their prey. Average dive depth was about 14 meters (46 feet). Sooty shearwater fly 65,000 km (39,000 miles) in a roundtrip journey each year. It is the longest recorded animal migration. Contrary to previous assumptions, sooty shearwaters do not make a big pan-Pacific sweep to cover all of the feeding areas in the Northern Hemisphere. Instead, individual birds went to just one of the three major hot spots and stayed there until it was time to return south to breed. The birds that travel to different regions do not represent distinct shearwater populations. Birds that came to California stayed in California, and if they went to Japan they stayed there and then returned to New Zealand. But two birds from the same nest can end up going to opposite sides of the Pacific, and birds from different breeding colonies can end up in the same place. The timing and route of the northward migration was variable, with birds crossing the equator at various locations over a period of about a month. At the start of migration they travelled east at about 540 km/day with the prevailing westerly winds. Some birds visited the coast of Chile before heading north. They appeared to use easterly trade winds to fly northward when the highest travel rates of 910 km/day were recorded. The return trip was remarkably synchronous, with all of the tagged birds funnelling through a narrow corridor and crossing the equator within a ten-day period in October. Ongoing research using tags redeployed on the same birds will show whether or not individual birds have preferred feeding areas that they travel to each year. A total of 33 sooty shearwater tracked throughout the Pacific were fitted with electronic monitors during the latter stage of breeding from January to March 2005 in two New Zealand colonies. Eight birds on Mana Island north of Wellington off the southwest coast, and 25 birds on Codfish Island/Whenua Hou off Stewart Island were fitted with monitors. Five of the Mana Island birds, and 15 of the Codfish Island birds were recaptured at their same breeding burrows during the period from October 2005 to February 2006. Nineteen of the tags provided complete track records, and 11 recorded diving depths. Sooty shearwater are one of the most abundant bird species in the world, with a total population estimated at about 20 million. Nevertheless, they are potentially vulnerable to changes in their food supply. 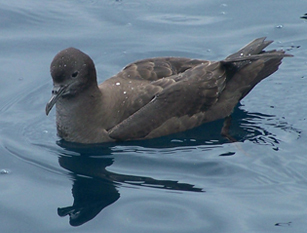 Sooty shearwater only breed in temperate and subantarctic regions of the Southern Hemisphere, in New Zealand, Australia, Chile and the Falkland Islands. New Zealand has by far the largest breeding population, with 5 million pairs in 80 colonies – approximately half the world population. The principal New Zealand breeding colonies are on islands off Stewart Island, the Chatham Islands, and subantarctic locations on The Snares, Auckland, Campbell and Antipodes Islands. The sound of hundreds of sooty shearwater returning to their burrows in the dark of the evening, after a day of feeding at sea, is one of the wonders of nature. The birds have mastered the art of crash landing, crashing through the tree canopy and hitting the ground with a resounding thump. Recent evidence shows that populations have declined at breeding colonies in New Zealand, and wintering grounds in the eastern North Pacific, probably as a result of climate change and commercial fishing interaction. Sooty shearwater are particularly vulnerable to fishing as they dive for freshly baited longline hooks, and get caught in trawl nets. Because sooty shearwater have a global lifestyle, they may be an important indicator of climate change and the condition of the health of the ocean. The sooty shearwater Puffinus griseus also known in New Zealand as the Titi or muttonbird, joined the 2006 IUCN Red List of Threatened Species as 'near threatened' after no previous listing. While the global population is still large, the near threatened status has been given because of a significant reduction in the number of birds. During the last 20 years the number of sooty shearwaters on the California coast has declined 90 percent. The sooty shearwater is listed on the 2005 New Zealand Threat Classification System as 'gradual decline'. Colonies on the Snares islands south of the New Zealand mainland are estimated to contain 2,750,000 pairs. Scientists report that between 1969 and 2000 there was a 37 percent decline in the number of burrows, and reduced burrow occupancy on the largest Snares colony. Mainland colonies also show signs of decline. The practice of muttonbirding is a customary right of specific Maori groups, allowed by special legislation in New Zealand. Muttonbirds are sold in retail stores throughout the country. It is estimated that a total of about 250,000 young plump birds which are larger than their parents, are mercilessly pulled from burrows each year worldwide. This is a small part of the decline of numbers, however, it is inappropriate that muttonbirding continues when the population is dropping significantly. In addition to Scott Shaffer, the coauthors of the research include Daniel Costa, professor of ecology and evolutionary biology, and Yann Tremblay, a postdoctoral researcher at the University of California Santa Cruz; Barbara Block of the Hopkins Marine Station, Stanford University; Henri Weimerskirch of the French National Center for Scientific Research; Darren Scott and Henrik Moller of the University of Otago, New Zealand; David Thompson and Paul Sagar of the National Institute of Water and Atmospheric Research, New Zealand; Graeme Taylor of the Department of Conservation, New Zealand; and David Foley of the University of Hawaii. Copyright © 2007-2011 TerraNature Trust. All rights reserved.